I have received several emails from young men "just starting out" either in business or in dressing. One individual is in high school, and wanted to have a few proper starters for heading off to college. This young man is unique, and his last line was "What I could be spending on [video] games would probably be better spent on clothes". Considering the fact that investing in proper clothing is something that will achieve the exact opposite of that which video games provide, he is well on his way to profiting from the detailed observations that his eye provides him. I look forward to hearing about his acquisitions. Several of these emails state the same issue: limited budget for clothing. Where does one begin? Is it possible to put together a respectable wardrobe with very little. The answer is mixed. If you are short on time, the task will be difficult. If you have a few years, it will be far easier. If funds are VERY tight, go immediately to a second-hand or thrift store. You are going to buy a jacket. The critical measurement is in the shoulders and sleeve. 3 button is better, but two button will do just fine. At all effort, find wool. Try them on, and take the time to really dig through the racks. If your budget is small, if you already have a suit or a jacket, the first thing to do is to tune them up. The jacket should fit the same in the middle as it does all over. Most people can stand to get their jackets taken in a bit in the middle. If you are heavy, this may not be an issue, but proper fit is still as important. Take that suit that father bought you for your cousin's wedding, or that old suit grandfather gave you, and head down to the tailor. If it fits well in the shoulders, it will cost less than $20. The two best things one can do for one's [jacket] style is to take in your jacket, and always wear a pocket square (white will do). Dig around the thrift store for an old-but-nice smaller silk scarf (yes... even a lady's silk scarf), and put it in your breast pocket (more on the folding technique in a different post). You can even use a plain white cotton handkerchief. For young men with a few suits that you wear to work, this is also the case. The financial districts in most major cities are full of young men who have overpaid for suits, and have underpaid for alterations. A stroll past the young lawyers chatting outside our government offices demonstrate the unfortunate effect that "politician style" has had on our young lads. The suits are all decent, but they simply swim at the lower torso and waist. Nobody will be offended by a simple white pocket square and a well tapered (by alteration) jacket. Again, even if you are not slender, there is still most likely room to take in your jacket. Most tailors can also add a third button and steam-repress the lapels with little effort, so consider this if you are a slender man. I think that you will be surprised with the results, and they are subtle... you will still be able to maintain your dear corporate conformity, and few people will realize that, no, it's not the jacket... it's the tailoring. This is perhaps too obvious to state, but I will do it anyway: a budget-minded man can do well in the thrift store, but he should be sure to hold out until he uncovers a jacket that absolutely suits him, meaning that at the minimum it should fit correctly about the neck and shoulders and that the sleeves are sufficiently long. Our man should then visit the tailor for a tune up, as you describe. I find, because my size is (usually) a hard-to-find 38L, that I need to search in many shops before having any luck. It took me two years to find an appropriate tweed jacket, despite diligently searching through dozens of consignment, thrift and vintage shops from North Carolina to Vermont. What I am getting at is this: when I was first learning how to dress, I was often tempted by the nearly-right jacket. You know the one: it's just a bit too ample about the shoulders. But you want to purchase it anyway because it's the right price and of dashing material. And maybe those buttons are a little daring without being vulgar. And you've spent so much time looking without uncovering anything decent. And the fit really is nearly there. Don't you think so, mirror? Wrong. I bought two such jackets before I finally learned to walk away from the damn things. I even took one to a tailor to see if he could bring the shoulders closer together. It was a costly operation ($70) and the results were bad. Buttons, cuff links, belts, braces, and even shoe laces are all essential components to a man's clothing. One silent and invisible feature to nearly all men's shirts are the little stays that go under each collar in their respective slotted sleeves (I will use the term slot for the purposes of this bit). The slots usually angle toward the collar points, regardless of whether they are deeply pointed, spread, or cut away types. Some shirts have slots that are parallel to the collar's spread edge, and some have stays that are sewn into the collar itself. I realize that some people call them bones, tabs, stiffeners, etc., but I call them stays. I have accumulated a rotating pile of these things from Lewin, Pink, Hilditch, Turnbull, Brooks Bros., Polo, and they are all drastically different, though the collar slots are relatively similar. I am in no way interested in keeping the stays organized by shirt any longer, so I usually just eye the pile, and estimate which will fit the collar of the shirt I have chosen. It should be noted that for the most part, I prefer to launder my own shirts (in a tumble washer) and iron them myself (professional cleaning cuts the shirt's life down to 1/10th in my experience). I have all plastic stays. I have been given mother-of-pearl, brass, aluminum, a pair of steel stays, and I even saw titanium in a catalog. For an unseen and always disappearing item, plastic is the only thing that makes sense to me. Still, after losing a bunch of stays, I was forced to buy a vile vial of them at Brooks Brothers, for about $14. It seemed expensive at the time for tiny plastic tabs, but I didn't want the ends of my collars to break formation when I have them flanking a tie. After I lost that entire supply, the solution came to me on a business trip. I had lost the pair I brought with me, and was feeling a bit hopeless. I looked around the room, and next to the small coffee maker, were some cocktail straws and my room key card. It seemed simple enough. I doubled it and put the point into the stay slot. They would have to do. I asked the front desk to send up some scissors (though I suppose nail clippers could have been used... slowly). It worked. On the second day, I cut the room key to pieces and used it to fabricate new plastic stays. I then remembered paying $14 for a few of these, as I sat with a new pair for free. It worked out perfectly. Now, I just keep the room key that the hotels give me, and make a few new pair each time I need them... for free. I have no problem with the luxury models of collar stays, but they are just not for me. It's not a style issue, its practicality. Is the French cuff applicable in a non-jacket setting, and is there any way to gracefully combine one with a sweater? And where is the upper limit of the barrel cuff's social applicability? I think we've all at some point had to wear them to a more or less formal event; can we say that a barrel cuff is applicable so long as it comes with a slightly less-formal suit, tweed say, or must it be limited to the sport jacket at most? Certainly a sweater prefers a barrel cuff, and naturally this is an important consideration for me as a scholar. I freqently find myself Franco-cuffed and sweatered. I think that silk-knots are the favored link for the sweater, and I give the sweater cuff a single turn-back that falls on either side of the silk-knot, NEVER concealing the cuff. The sweater, like the jacket, should always be showing linen. As I write this, I am French-cuffed with no tie or jacket. The barrel cuff is acceptable in formal settings, but in order, I would rate the French type first (following the rule that more fabric is better, and your everydayer can't figure it out), then the fitted barrel, and lastly, the side-by-side. I am also of the thought that all of them are perfectly acceptable in just about any setting that allows for a turn-down collar. The barrel-cuff, following the rule, can be made more formal, by adding buttons. Turnbull & Asser puts 3 vertical buttons on each cuff, a pain to do and undo, but it is more formal. Three seems to be the limit, though... I could hardly imagine four. The ever-present side-by-side buttons are strange, because when does one ever adjust the setting? Of all the measurements on a man's shirt, it seems that the one that has nearly zero chance of changing is the wrist measurement. Also, on sweaters and cuffs: The barrel cuff is obviously better for the unbuttoned turnback over the sweater cuff... one of my favorite sweater/cuff positions, impeccably executed often by my friend in New York (carrying firewood, impromptu under-hood examinations of roadsters, and mid-autumn day cocktails on a porch). I have received several emails about this since posting, which is strange, because nobody reads this blog. The emails suggest that the French or "double[d]" cuff is formal only. There is only one possible origin for this idea: Those for whom the French cuff is new and recently discovered are still taken with its novelty and most likely own shirts in blue, white, or other solid. To them, this would seem to make the French cuff "luxurious", and I'm betting, only worn with metal links. To these individuals, the cuff accompanying an expensive shirt translates inseparably to "formal", but this is purely a matter of one's custom. To prove this point, I will commission from my local shirtmaker, and once complete will post pictures of, a rough flannel tartan shirt with French cuffs of the same flannel. I will then split firewood in it. This will neutralize that silly claim once and for all. I will surely still get one email saying "Sir, that French cuffed flannel shirt should only be worn for formal occasions." I also suggest that readers disagreeing with this claim view the photos in the "Reviving Shirts" post several posts down. I wanted to briefly lament the shawled collar. I have often tried on jackets, smoking and otherwise, and have just never looked right with a shawl around my neck. At first I thought that the trouble was the usual one of finding a jacket that fits my long and narrow person, but conversations with Boston have convinced me that they simply will not work on someone who looks like me... very tall and very thin. So while I have always craved a shawl, I think they are things I will need to admire from afar. Pity. But better to silently experience pity then to look like an over-worked, possibly dying ox with a too-thin neck. This question is for Florida panelist: may I pull your electronic ear a bit further on the wearing of a black or white tie? It may connect into your position on traditional vs trendy. Or possibly not. The matter: I have a velvet suit that is reasonably formal, but not a tuxedo. The thing is a very dark blue -- a deep, deep navy. While I think velvet has become trendy among a small set, this particular number is from Sweden, probably the 1960s, and is of a staid, respectable cut. The velvet is superior to what is commonly available today. New York and Boston Panelists have seen it worn and can speak to its character more eloquently than can I. To get to it, I recently escorted a lady to what was called a "black tie" event -- a dinner at my university for holders of a supposedly prestigious fellowship. Of course, nearly every fellow there was in rental garb complete with pre-assembled black bow ties. Nearly every fellow wore a jacket that swam copiously around their stomachs. As per expectation, men looked very similar to the waiters serving them, who were also wearing black bow ties, also pre-assembled (the big difference being that the waiters wore no jackets). In contrast, I wore velvet. I did this with the idea that though my suit might be a notch less formal (and, indeed, had notched lapels), the fact that it had been well tailored would actually put me in a more respectable class than the other men in the room. And I wore a white tie because it works much better with blue than a black one would have. Perhaps this was a transgression? Was my thinking wrong? I suppose a lot of this thinking revolved around the correct prediction that, though the event was billed as black tie, many of the gents in attendance would wear second-string garb. I figured I'd be fine so long as I wasn't in a business suit. Now if I had been invited to a formal event at your house or a Boston's club then I would have expected a different standard and would have dressed accordingly. Hmm . . . a lot of this is expository. A larger question is: what is our duty in situations where black tie is called for but you can expect almost no one to rise to the occasion? I am afraid I already know the answer to this: it matters not about those who never rise. I just hope I wasn't as guilty as the renters in the not-that-black-tie affair I described. Actually, I hope to suffer no guilt at all. At the time I felt like the only fellow in the room who looked well enough, even though my tie was white. But our recent string as caused me a bit a distress. I will wait for Florida's response, but I offer this as my unsolicited bit. When the event is billed as "black-tie", the first question to ask is "Do they mean it?" Not that one should show up in a suit if he event is billed black-tie, but the designation, I have found, is really a way of ensuring that everyone adhere to a degree of similarity, because nobody wants to say "wear a coat and tie for God's sake", though that's what they want to say... rightfully, yet sadly so. You actually achieved what the invitation was really getting at in my estimation... a standardized degree of formality, to which you added a shot of bubbles (needed too, by your description of it). I have seen your velvet suit, and with it's exceptional tailoring, and I think that you made the right choice. The choice becomes much less right once you acquire a proper rig, and which point you will be able to intimidate fellow party-goers with the taper. As for the verticality and accentuation of the shawl collar on your frame, I have nothing to add to your analysis, because it is simply correct. As we wait for the final word from Florida, I'd add something to what our Boston friend has said. Let me assume the historical viewpoint: black tie was invented by Poole for Edward VII when he was still only 19 and the Prince of Wales. From the beginning, it was intended as something less than entirely formal (i.e., not for ceremonies) specifically aimed for dinner party use. Thus, when properly worn as in New Haven's case for a dinner party, any departures from simple black tie must be in the spirit of dinner, of going out. In this vein, the substitution of velvet for a traditionally less-tactile material seems to me an almost orthodox choice if executed in the right spirit. Now, departing from the historical view, I'd say that these days having one's clothes actually fit counts for much. To put it as nicely as I can for our benighted age, one can no longer earn demerits for breaking rules, only credit for what one does carry off. We may no longer dress to uphold a dead standard, but only as a tactical gesture in the war to maintain any standards at all. In this sense, velvet too can be a weapon. A slight digression. I like words and the English language, and have for years. I am not particularly good at English, but then I was never particularly good at rugby, but that never stopped me from arguing over the game and how it should be played. I blush when I think of how many years I've spoken of the beauty of the English language, and how it is so vibrant and alive by borrowing from others, without ever realizing that you can't keep something alive without evolving it. Now, granted, without rules, the language would disintegrate, but there is a balance between rigid adherence to rules without reason and evolving standards. You see where I going with this. The very nature of the creation of the tuxedo is one of change. Change from the rigid formal standards of England's royal court society to the emerging mercantile centered society. Mercantile society in England was always in the shadow of the royal court and never really developed, but America started with a somewhat cleaner social slate. I think there should be rules. I don't think the rules should be changed just because we can, but I think we should do what we are doing here - looking at the rules, talking about them, and seeing if they apply. But not be too quick to change them at the whim of fashion or commerce. Remember what your fathers looked like in their leisure suits or bell bottoms. The fate of fashion rests on your shoulders. Your dress should be a reflection of your character. Did the clerk give you a twenty instead of a one? Did you return it? Of course you did, as a gentleman even when no one is looking. [name withheld] arrived and changed into blue Albert shoes with gold monograms. Does anything say "this is my club" better than that? Very personal. A signature piece. He started off with traditional wear and made it uniquely his. I believe in understatement. Deplorable fashion comes from those that see what [name withheld] did and try to copy and add to. Boston's comment on traditional wear with loud socks is in the same vein as [name withheld]'s statement. Personalize, don't parody. Try for only one change at a time. New Haven's velvet suit is a good example of when standing out in a crowd is good. A European tailored suit in a sea of ill-fitting rentals sounds like a winner. Transgression? I don't think so. If the white tie worked, and you were not being a parody - good. This is my recap from your comments. -- Jacket: Black single-breasted, single-buttoned, with peak or shawl lapels. White limited occasions. -- Tie: Black (and real of course). White ties ought only to be worn with tailcoats. --Trousers: no belt loops, with piping or braid of silk or satin running along the leg seam. -- Shoes: black closed-toe oxfords with leather soles and a good shine. If you have the time, I thought I'd ask your opinions about formal wear. I recently acquired a trim, white dinner jacket with peaked lapels that I consider to be of excellent cut, but now I confess to some confusion over how to next proceed. Well, the obvious next step to to pick up the right pair of black trousers -- easy enough. And I already have both black and white ties. But I am a little tripped up over shoes and shirt -- most tuxedos I have encountered in life have been of the rental variety, and without a proper model I find myself (with eyes cast down) fumbling with the details. For example, must shoes be of patent leather? Is it permissible to use, say, a conventional white shirt from Thomas Pink with black or white silk links? I'm sure there are other concerns I am overlooking, but for now let's start with those. Let me say that I am also on a student budget. Thank you in advance for your help with this embarrassing problem. Excellent question. The very best trousers (and most correct) are made for the 'Tuxedo'... they usually have a satined stripe/seam down each leg, are uncuffed, and have no beltloops, though they do have inner buttons for suspenders. If the dinner jacket has more than one button afront, it may be worn with other combinations, like velvet pants (?). If the lapels are satined, you should restrict it to proper black-tie attire. I'd start by going to tuxedo rental places and asking to buy a pair of proper trousers (used, of course) with at least some wool content. Now, as for the shirt, a plain white shirt will do, until you can get a proper turn-down collar shirt (more versatile) with a textured bib. Once you have that shirt, your next one should be a winged-collar. In all cases, French cuffs are the choice. I actually prefer to wear silk knots with my dinner jacket, instead of the metal types, and I match them to my pocket square (the plainer, the better for black-tie). I also rarely use the studs for the front buttons.... both of my shirts came with a ribbon with the buttons attached, which is what I wear. Brooks Brothers actually make a decent shirt for this. Shoes: Shiny patent leather. I wear wing-tips with suits, but I have shiny patent leathers that only come out with the dinner jacket. Shirt: White wing-tip formal or lay-down formal. I prefer the wing-tip. Anything else says, "I don't really care/know enough to wear a proper shirt." Tie: Black, unless you have full tails. Avoid trendy variations. I was about to go on at length about trendy vs. traditional, but we can bring that up in a later discussion. -White ties ought only to be worn with tailcoats, as Florida Panelist aptly notes. -The jacket should nevertheless be single-breasted, single-buttoned, with peak or shawl lapels both acceptable. I prefer shawl in principle, as a reference to the relaxed smoking jacket from which the dinner jacket is derived. Notch lapels smack of the business suit and thus have no business at a formal event. 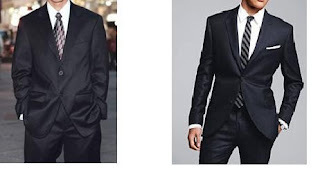 -For even semi-formal event attire such as black-tie, one needs a shirt with a standing collar, for the same reason that the jacket ought not have notched lapels. It ought also have french cuffs, and studs in front rather than sewn buttons. I lean away from any frills, pleats, or other decorations on the shirt front, though. -A vest may be worn for full effect, but it must be the right sort of vest, of the same material as the jacket and with a formal cut. The chance of laying hands on an acceptable vest is quite limited unless you have your own tailor. Failing this, I think the old imperial Anglo-Indian cummerbund is still quite good, though it should be of limited width and black in color. Bonus points for wearing one actually procured in India. -The trousers cannot have belt loops, as Boston Panelist notes. The piping or braid of silk or satin running along the leg seam is not absolutely necessary, but is a safe choice. -My age compels me to side with Boston Panelist and not Florida on the matter of patent leather: as long as the shoes are black closed-toe oxfords with leather soles and a good shine, this is enough. (Though as a historian I regret the passing of the opera pump, I think it would be excessive to pretend that it has not passed out of use. Real patent leather made with linseed oil would be grand, but these days nearly all patent leather is made with a plastic coating substituting for the linseed oil treatment. Patent leather may remain the standard, but there is now room to depart from it and remain a gentleman. -Not sure about whether the shoes may be brogues, i.e. wingtips. Depends on the occasion for the attire, I guess. Something entirely festive, maybe so. Something more honorary, probably not. Finally, I love the idea of going to a club dinner or private party or other only nominally semi-formal event with a further slide toward private house attire, as in the example of our [name withheld]'s shoe swap. What would you think of the jacket sliding into the formal end of smoking jacketness, or of replacing the bow-tie with a black cravat secured with a pin? Actually, this last is potentially even more formal than the bow-tie, and could more easily be worn with a tailcoat. I'm very tempted to try it some day. There has been a bit of talk about the velvet slipper lately. I have always known them as Albert Slippers. This is the same Albert whose son, Edward VII is the person (it is said) for whom we leave the bottom buttons unfastened on our jackets, sweaters, waistcoats, etc. I have generally been happy to see them worn in familiar settings, venturing outside of the house (the club, familiar parties, friends houses) during the colder months, but have noticed men wearing them around the sidewalks as loafers. Wearing them in one's house is always right, and to wear them to a party (because one's snowy boots are left at the door) is both easy and a nice tribute to the host, indicating your comfort with the setting but still honoring the event. I also enjoy seeing them with black-tie, again in more familiar settings. Green, blue, wine-red, and with nouns embroidered on the toe are all acceptably daring. I am not quite ready to see them on the street, though... that is for the loafer, not the Albert house shoe. Since the soles are usually thinner leather, wooden floors and rugs are the only surface suited for them under foot. I recently acquired a new pair from Del Toro in Palm Beach. They make a solid black slipper in velvet, usually around $125. The gents there have expanded into embroidering and expanded color selection, and I got one of the early prototypes from them: black with pheasants on the toe. They are certainly far less expensive than Shipton & Heneage at $500 or so, and John Lobb asks around $6,000 for their bespoke models. Other makers include Trickers, Charles Gale, Stubbs & Wooton, Bowhill & Elliot, and Church's. The Del Toros have suited me perfectly, and are obviously very comfortable. Brooks Brothers makes a pair for around $200, and Ralph Lauren offers them at almost $900. One hilarious aspect to the Ralph Lauren models is that they only offer them with their logos or the initials "RL" on them. I think that Brooks Brothers also offers "BB" on theirs. If you are going to the trouble of getting some nice Albert shoes, at least have your own initials (or family member's) on them. The Del Toros fit into the umbrella pocket on the inside of my long winter coat, so they are easy to bring along to parties during the winter. The Albert house shoe is a good idea, but they are not loafers. A quick dash across the street to the butchers, or visit the neighbor is the extent of their outdoor use. In a familiar setting, they tell the host that you are comfortable at their party, but that you still have the sense to dress. One short note about the emblem: since the majority of them are English versions (obviously the originals), they usually appear with crests or marks of the royal family on them like crowns, ostrich plumes, etc. It is usually inappropriate for any U.S. citizen to wear these images, unless they do so in specific and verifiable tribute. As the holiday season approached, I took the usual path of breaking out my various pairs of pants with nouns embroidered on them. Of the various pants in the drawer, my favorite is a pair I found about 13 years ago at a thrift store in Hyannis. I think that I paid $4, or so, and an examination of the sewing indicated that they were bespoke. Bottle green corduroy, with little water fowl all over and a sturdy cuff, they have literally elicited curse-laden heckles from men in trucks driving along the streets of Boston. I realized that I needed a pair of shoes that were as interesting as the pants for wearing around the house (but not out). I have several pair of Allen Edmonds shoes, which I find to be generally excellent in all ways, and I thought I should stick to them. I wanted to make a slight mockery, but still be with in bounds of reason, so I realized that I would be modifying the shoes slightly. I have always disliked the tassel loafer, and find them to be ugly all around. Low vented, and usually an after thought, they more often than not ruin a good ensemble. What better shoe to modify than the cursed tassel loafer? Since I would be wearing these shoes about one month per year (Thanksgiving - Christmas), I was not about to buy a new pair from Allen Edmonds ($300+). I found a pair of Allen Edmonds in my size on Ebay for about $10, and they were in near perfect condition. They arrived, and I set to work. A $1 length of green velvet ribbon, and 2 gold colored nautically themed buttons for about $1 would be the tribute. I happily cut the tassels from the shoes and unthreaded the leather strap through the heel. I easily replaced it with the green velvet ribbon by rerunning it through the holes and tied an ostentatious bow, securing the gold buttons at the knot. A quick polish, and they were unique enough to try out. During the maiden voyage (Thanksgiving) they seemed well-received, initially to widened eyes. Since they were good shoes to begin with, the comfort was instant, and they made the perfect Holiday house shoe. Combined with the green water-fowled pants, they fit right in. Perhaps they are a perverse tribute to the opera pump, but the Holidays are good times to pull off that sort of thing, surrounded by friends, and usually indoors. As I buttoned the top button of my shirt, I noticed the fraying was getting a bit worse, and reaching the ends of my collar tips and cuff edges. French cuffs tend to wear out at the outside fold, and it seems as if barrel cuffs wear evenly, and around the outside edge first. In the past, I had recycled the shirts by cutting the back panel out, hemming it, and making a nice pocket square from it. I checked my closet, and realized that there were about six shirts which were all reaching the same level of collar/cuff fray. The collars wear out on the tips (even on cutaways and spreads) and the back turned-down ridge (or "spine") of the collar. Since the shirts were mostly nice shirts (T.M. Lewin, Thomas Pink, Turnbull & Asser), I cringed at the thought of taking scissors to the back panel, and popping off the mother-of-pearl buttons to save. What to do? I found a shirtmaker in Wellesley, and took a car out to see them one Saturday. I knew that matching the patterns on the fabric would mostly be impossible, so I decided to have the tailors replace the collars and cuffs with a conservative white collar/white cuff theme. Two of the shirts were white background with butcher checks, one black (almost a windowpane) and one green (a Brooks Brothers shirt). The other shirts were two striped numbers, and a solid blue one. The tailor, Harry (320 Washington St. Wellesley) showed me books of swatches, and a lightbulb flickered on in the dusty attic of my brain. Blue fabric for the collar of the pink striped shirt! White for the blue shirt (not too daring), and the green butcher check? With the tailors blessing, I stretched out my boundaries a bit. I started out with the blue one. Here the original collar and French cuffs are shown next to the new attached set. A standard shirt. I went next to the striped shirt I had. The barrel cuffs were replaced with French cuffs, and the collar was replaced as well, both in a light blue to match the pink and blue stripes. Not bad. My next shirt was the green and white butcher check from Brooks Brothers. It was a middle-of-the-road quality barrel cuff with a spread collar. In the swatches, I found a nice herringbone blue. I was feeling a bit liberated, and the approving nods from Harry the tailor encouraged me further. The above shirt could be worn with a suit and a tie in many business settings, but I was getting close to the edge of what could be pulled off. When the Thomas Pink shirt with the thin butcher checks and cutaway collar was put on the counter, I decided to take this shirt out of the rotations of business-acceptable, and toss it into the cocktail party category. I found a very tight lime green butcher check that was different in size enough to be interesting, but similar enough to be daring. The color was outlandish, and the with the cuffs, it was almost overwhelming... almost. Again it is pictured below with the original French cuffs and cutaway collar. I could almost imagine the looks when wearing this with with a navy blue tie with little nouns on it, blazer, and light gray flannel pants. The tailor gave me one shirt back incomplete. He correctly pointed out that the fabric was simply too worn to reattach new components. It WAS a high mileage shirt, but he included the cuffs and collar (pink) anyway. It was a shame, but I realized that I had another fit that could work out in the future. The Turnbull & Asser shirt had three-button barrel cuffs (which were a bit of a pain). Putting on the shirt meant buttoning three buttons on each wrist. I decided to keep the cuffs and collar (obviously), and to turn the worn-out shirt into a pocket square and handkerchief. In my closet, was another older Brooks Brother shirt that I thought would look good with the pink cuffs and collar, since the Turnbull & Asser one was unrepairable. The good candidate was a tight butcher check in blue with barrel cuffs and a medium spread collar. In the below picture, I was trying to imagine what the shirt would look like with the pink French cuffs and the new pink collar. I wrapped it around the existing collar, and I thought that it looked pretty good. The last step is cutting off the old buttons from the barrel cuffs and from some of the collars, since they are all mother-of-pearl, and I'll toss the scraps, or retire them to the shoe polishing box.